The world would be a peaceful, more harmonious place if there were more occasions for both. Humour connects people. Laughter creates inroads for friendship. The other day, my daughter and I stopped at a new Hannam grocery store. We needed some vegetables to make soup. About this grocery store, it is big. A big box with a red and white sign placed amongst the grey of buildings and a main arterial road. It basically calls out for passersby to, well, stop. So we did. It was our first time in this store. We had shopped in Korean grocery markets before, but this one was really big. And so interesting. And we were determined to try something new. We noticed but weren’t going to make a big deal about the fact that we were the only Caucasians in a whole store of Koreans; after all, we live in Vancouver – the Gateway to the Pacific so this is not unusual at all. We wandered through all of the food aisles. Colourful packaging. Korean characters. We picked up the leafy greens and root vegetable we were looking for. We checked out the latest appliances. Mini washers. Massive rice cookers. Such brilliant designs and so different from anything in traditional Canadian department stores. We had no items other than the produce to show for the length of time we had browsed the store. When we got to the checkout I realized I was still yearning to purchase something memorable to bring home. I love to travel but my recent exploration has been while on “staycation” – holidays around home – looking for things to perk up my senses and help us imagine the world out there. There were several people ahead of us, so I had time to view the checkout counter. There were many small products stocked up on the shelving around the checkout, and one caught my eye. 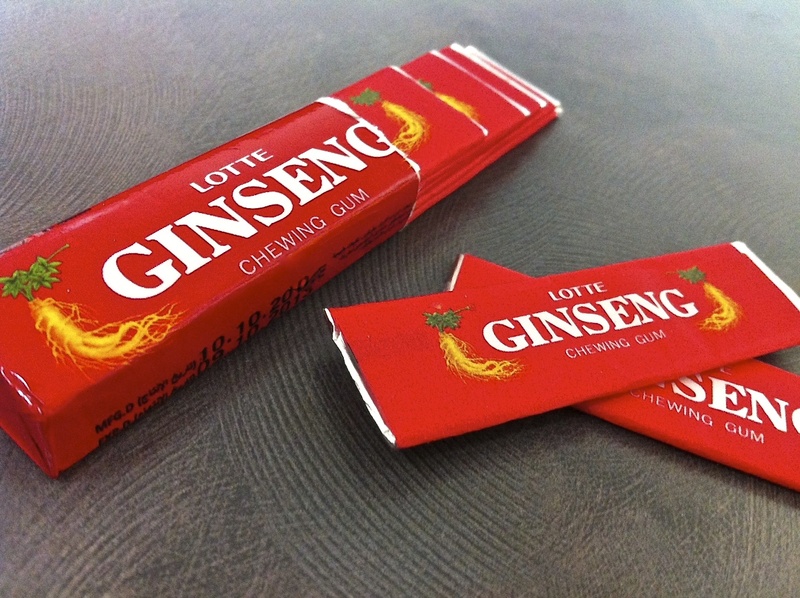 A bright red package of Lotte brand Ginseng chewing gum. Hadn’t I read somewhere that, for some reason, ginseng was very healthy? I picked up a package and read the ingredients. No aspartame. Another winning feature. I whispered to my daughter that I was going to purchase this gum. We were one human away from the checkout clerk and I did not want anyone to hear me. I would never freely admit I felt out of place (I didn’t feel that way I convinced myself) but I did not really want the checkout clerk to notice that I may not be, you know, totally cool with this purchase. My daughter’s eyebrows raised and her head nodded. In our family, we don’t buy candy on impulse. Of course she wanted the gum. Thinking suddenly how deprived she must feel because of our no-candy rule, and that I must be a terrible mother, I went even further. I took two packages of Ginseng chewing gum, not one, and placed them both beside the vegetables. It was our turn. A young woman robotically began to ring in our purchases, and a young man began to bag our selection. Neither said a word or made eye contact; we reciprocated in silence. The young woman reached over and picked up a package of the gum. For just a second, I could have sworn she looked us both over, and then proceeded to ring in the two packages. Passing the gum over to the young man, she released an audible burst of air from her tight lips. She quickly looked downwards, and I was still trying to figure out if there had actually been a sound when she looked at the young man, who caught her gaze for just a second. Something was definitely going on. She then stopped the transaction cold. “This gum,” she said, “it is for health.” The young man nodded his head many times in agreement. “You know, grandpas come in to buy it?” she added. Her eyes became wide. The young man cracked a grin. Immediately, he shut it down, looking very serious again. Then suddenly, the young woman openly laughed. She just as suddenly became serious again, and said, “Do you still want to buy it?” The two store clerks stood as robotically as they had begun and waited for us to answer. The world slowed down to the speed of a leaf’s growth. It was our turn. What should we say? This was turning out to be very embarrassing. We had entered the store, unsure of its contents, and chosen something completely unsuitable. The headlines would surely say, Two Caucasians completely out of their element buy gum meant for seniors! The tension was unbearable. What would we say? Horrified, my daughter and I caught each other’s eyes, and in that twinkle of a knowing glance, we realized how funny the whole scenario was. Of course our purchases were being scrutinized; we were obviously completely out of our element there. We really had no idea what Ginseng gum was. And these two were trying to warn us as politely as possible about our mistake! It was hilarious. Unable to contain ourselves any longer, my daughter and I started to laugh. Our laughter gave the two store clerks permission to laugh. In that moment, all the tension subsided. The clerks smiled; four lifetimes of good times and common interests passed between us; I came to know their souls and they welcomed our spirits back to enjoy the coming shared peace in the world. We grew to understand Korea more than we ever had before, the food, the pride in culture, the subtleties in language and mostly, the humanity we share on this planet. In our laughter we realized we had no differences and nothing to be uncertain about. I picked up the gum, “Sure. We want to try something new. We’ll take it.” With the four of us still giggling, my daughter and I walked out of the store – owners now of a memorable moment, and of course of two bright red packages of Lotte Ginseng chewing gum. In the car on the way home, we popped two pieces of chewing gum into our mouths each and analyzed its rather soapy taste, enjoying the flavour yet at the same time, we understood why young people likely do not buy the gum! Next time we go to the Hannam Supermarket, we are going to talk to customer service first. We think they would probably be happy to advise us on what we should try. We might even share a laugh, or two.